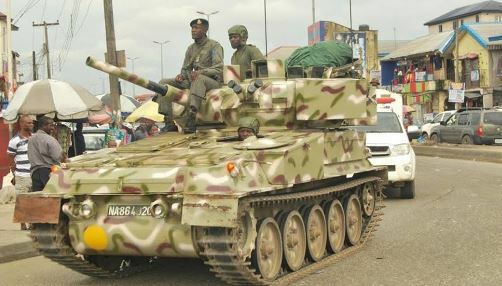 A video showing the Nigerian Army conveying armored tanks into the South-eastern region in Nigeria allegedly to tackle the Biafra uprising has surfaced. Just few days ago, it was reported that security operatives have increased the number of their personnel in the South-East and South-South zones of the country as part of measures to prevent a breach of peace, which may result from the activities of Biafran agitators ahead of the upcoming Anambra State governorship election. The police also reportedly said it was waiting for court pronouncement for the arrest of the leader of the Indigenous People of Biafra, IPOB, Nnamdi Kanu. Nigerian government had previously demanded that the Federal High Court in Abuja revoke the bail granted to Kanu. It seems the free days of Mr. Kanu, a United Kingdom returnee are numbered following allegations of him breaching his bail conditions. At least 10 trailers conveying armoured tanks and military hardware were seen entering the South East as residents and passersby watched in panic. the court revoke his bail and order his re-arrest for allegedly flouting his bail conditions.